TAO was ashamed. He had been guilty of one of the worst delinquencies known to the Cave People. He had permitted the fire before the tiny cave at the bend of the river where Og and Ru were camped to go out. By this neglect he had endangered the lives of his companions, as well as his own, for while they slumbered, the only protection the Cave People had against the great wolf pack, or prowling sabre-toothed tigers, or savage hyenas, was the lighted camp fire. So long as it burned before the cave, it held back the nocturnal killers. But as soon as it went out the animals lost both their fear and their respect for man, nor did they hesitate to enter the caves, kill their occupants and drag them out to be devoured. So he who neglected the fire and allowed it to burn out in the night hours was guilty of a great crime, punishable by a flogging at least, and death where the neglect was too flagrant and the results too serious. Keeping the fire was Tao's duty. It was the only reason why Og and Ru had brought him along on this important journey. They had to have some one to guard their camp and keep the flames fed, for it was always harder to make a new fire than to keep an old one perpetually alive and ready to be fanned to flame at a moment's notice. Tao had let it burn out. In the small hours of the morning some time, he had lapsed into a sound sleep instead of waking every so often to heap on fuel. The result was that when Og and Ru aroused themselves at dawn the ashes were cold. 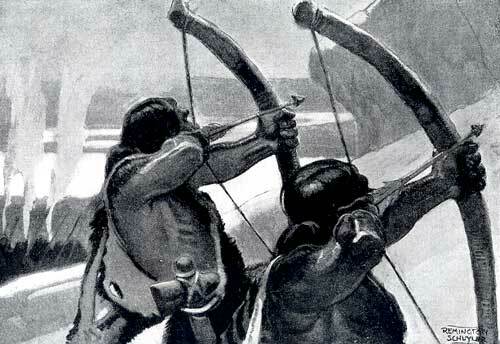 Both the Big and Little Bowmen, as Og and Ru were known among the Cave People, were very angry. Tao received his flogging, sound cuffs and thumps with a stick, until he had crawled into the darkest corner of the little cave they occupied, and cowered there, whimpering, more from shame than from pain, however. As he crouched there he could hear Ru, as he broke a marrow-bone with his stone hammer and ate the contents, still berating him. "It is only good luck we are still alive instead of filling the bellies of a pair of hyenas. Tao is a useless fool. We never should have brought him. He will be the death of us yet. Mark how I have spoken." "He has suffered the penalty. He will be more careful next time," said Og, as he tore the last shreds of partly cooked meat from a bone he was holding. "Not Tao. He is never careful. Always his thoughts are somewhere else, never on what he is doing. Always he is scratching on rocks or marking in the sand, or mumbling words that mean nothing. We should have brought a young hunter. Not this fool who can not draw a stout bow; a picture maker. What good is he in the forest? It is a wonder he has not been killed before this. Some day it will happen and we may lose our lives for it. Give me that bone yonder. There is still meat on it. This morning we leave him nothing. One who neglects his duty should not be left good things to eat that others have hunted for him." "If such a dreamer as you should starve to death it might be better for other people. Find your own food to-day and mind you have the fire burning when we come back." Then turning, he stalked off into the forest. "We will be gone until the sun starts to march downward. Mind you do not deserve a worse flogging when we get back." Then he, too, moved off into the forest. FOR a long time after they had gone Tao lingered inside the shallow cave. As the sun climbed high he came out and looked ruefully about. He was younger than Og and Ru by several years, but that difference in age did not entirely account for the fact that he was neither as big nor as strong as the Big, or even the Little, Bowman. His hair was long and straight and black and held back by a leather thong as was the hair of Og and Ru. But his face was not as rugged, his jaws were not as powerful, nor his eyes as deepset and as cold and expressionless as those of his two companions. Nor were his hands as thick and as strong as theirs. Instead, they were inclined to be long and slender, with fingers that seemed to taper, whereas the fingers of his companions were short and stumpy. For the rest, he was like Og and Ru and the other Cave People. He wore a bearskin shirt girdled at his middle with a thong. His bare arms were covered with coarse, curly hair as was his chest, his thighs and legs, and the backs of his hands. But he is quite unlike Og or Ru or any of the rest of the Cave People in temperament and interests; so unlike them in fact that he was almost a tribal outcast, and but for the interest of Og and his parents, Ab and Nol, he might indeed have been one. He was not particularly interested in hunting. He appeared to be a weakling, almost a coward, seeming to avoid danger and preferring to stay around the village of the Cave People, doing little for his food and the place he occupied in the cave of his family, save scratching queer designs on stone or in the sand, much to the disgust of the other cave dwellers. Secretly, however, many of the Cave People had to admire his peculiar ability to make pictures. He could make lines and scratches on stone or in the sand do queer things. He could make them take the shapes of a woolly rhinoceros, or a hairy mammoth, or a giant mastodon so that one could easily know what they were meant to be. He could make words obey him strangely too, and by twisting them about, he could make them into a song with a peculiar swing to it that frequently told a boastful story. People liked to hear him make up these stories about their own achievements as hunters, when they had time to sit around the fire and listen, which was not often. Life was too hard; too serious and full of difficulties to give them much leisure. But the seriousness of life and all its difficulties did not seem to bother Tao. He never hunted, rarely fished, and only when he was very hungry himself and the food in the family cave was all gone, did he dig for mussels in the shallows of the river. He preferred to sit in the sun, and think strange thoughts, or make scratches on stones, or form words into songs. Even his father and mother did not understand Tao, and such old men as Ting, the village wise man and chief, and Niu and Sul, old graybeards of the village council, shook their heads sympathetically, and told Ab, that it was an unhappy thing to be burdened with such an offspring. The young men, like Ru and Og, took little notice of him for their interests in hunting took them out into the forest where Tao rarely ventured, and they had little time to associate with him. Indeed sometimes when they returned with the day's kill and saw him mooning on the top of a great rock beyond the village apparently very idle, they laughed at him and called him lazy. But Og, the Big Bowman, as he was called among the Cave People, was more attracted to Tao than any of the other young men of the tribe of Cave People. It was strange to him to see what Tao could do with lines and words, and more than once he sought him out and talked with him, sometimes sitting there on the top of the big rock with him, where Tao had traced many pictures. As he watched Tao work or listened to him talk, he realized that the boy thought queer thoughts that never entered the minds of the other Cave People. His hands were strangely fitted to do things that the strong, stumpy hands of other Cave People could not do. In truth, when Og showed him how to chip a flint arrowhead, an art Og had only lately worked out for himself, Tao took a piece of flint and promptly made a much better one. So Og came to know him better and like him more than the rest of the Cave People did and when the Big and Little Bowmen ventured forth from the cave village to find a new source of salt for the Cave People, Og told Ru they would take Tao with them, as fire tender and cooker of food. THIS quest of salt was an important venture. The supply that the Cave People had used for years had become exhausted. A certain salt lick on the side of a mountain had always provided them with this commodity. It crystallized on the rocks and coated the sand with a fine white frosting which was easily gathered. But with the change of seasons, a great landslide had buried the lick under tons of earth, nor did the water of the spring that flowed from the lick ever again work its way to the surface. This was a calamity. Salt was a necessity. Medicine sand they called it. It made their food palatable. They had to have it. So the village council, after long deliberation, selected Og and Ru, the Big and Little Bowmen, and considered the best of the village hunters, to fare forth and journey southward until they found another salt supply. It was an important mission and a dangerous venture for they would be traveling into places where Cave People had never gone. No one knew what strange animals, or what strange people they might encounter. They would have to travel far and make many camps. They would have to have a camp keeper and a fire tender, and though Ru objected, Og insisted that Tao go along with them to tend their fires, and cook their food while they explored the country. It was a long and dangerous journey. They had been gone from the cave village two full moons now, and had traveled far to the southward exploring the country. They bad set up a camp where they found a shallow cave at the bend of a strange river where it coursed along the foot of a ridge of great chains of mountains. It was likely country for a salt spring and Og and Ru were searching daily for some source of supply for the Cave People. It was on this same quest that they had departed so early that morning, that Tao had allowed the fire to burn out. Tao's first interest of course, after he came out of the shallow cave and found them gone, was to build the fire. This he did, hastily finding fuel and tinder and working with two flint fire stones until he got a flame which he swiftly fanned into a blaze. Then with the fire going, he thought of food. He knew that Og and Ru had not left him any. He did not expect them to after such an omission of duty. It was justice. He was in disgrace and did not deserve food. But good food was handy. He glanced toward the bend in the river. There were plenty of mussels in the muddy shallows. Fortunately they were easy to obtain too, and as Tao waded into the river and felt the slime of the bottom ooze between his toes, while the water lapped his hairy legs, he resolved to glean enough shellfish not only to supply his own needs but to provide Og and Ru with some when they returned at sundown. So he dug industriously, washing the sand between his fingers, and tossing the black-shelled bivalves up onto the bank. And so assiduously did he labor and so interested was he in acquiring a big store of food that he lost all track of time, and of his surroundings. The result was he did not hear a soft stirring in the bushes that lined the river bank and the nearly silent tread of feet on the sand bar behind him, nor was he conscious of the presence of anyone in the vicinity of the camp until he straightened, and turned to toss a great handful of freshwater clams up onto the bank behind him. It was then that his quick eye caught a shadow across the sand. With a grunt of surprise he looked up to behold a startling figure watching him with an almost sinister stare. Tao had never seen this man before nor one just like him. He was short, dark, squatty looking, with great sloping shoulders, long arms, big hands and short sturdy legs terminating in large feet, with long, almost prehensile toes. His body was covered with thin short brown hair; not the thick, coarse black curling hair of the Cave People. He wore only a loin cloth of jackal skin, not a full shirt of bear or tiger skin such as the Cave People wore. His head was small, round and peculiarly flat on top where his low forehead sloped abruptly backward. His brows were bushy, his eyes small, deepset and far apart and his nose flat and broad. His jaws were strong and powerful, showing great yellow teeth between thin lips. He was not alone, either. As Tao glanced about he saw two, three, four more men of the same type, watching him from the brush that lined the river bank. Like the first, they all carried big war clubs, armed at the top with flat stones shaped to resemble the stone hatchets of the Cave People. THOUGH he had never seen these men before, Tao identified them at once. They were the people known as Flat Heads who dwelled far to the south of the Cave People, beyond the mountains. He had heard of them. Once Sud, an old man of the Cave People, had encountered them; indeed he had been captured by them and had miraculously escaped, and the stories he told of them had become legends among the Cave People. They were a savage, barbaric race, who knew nothing of the use of fire, did not know how to make many implements of stone, and who lived chiefly on fruits that were abundant in their country. When they ate meat at all, they ate it raw. As Tao looked into the small, savage eyes of the leader of the five Flat Heads, many stories that old Sud had told about them came back to him, and for a moment he went cold with fear, for he realized that he was helpless before them. All five men were bigger and stronger than he. Moreover they were between him and the cave here he had left his only weapons, a stone hammer and a flint knife. There was no way of escape for him save to plunge into the river and try to swim across. That would be folly for he realized that with one good throw of a stone or a war club, he might easily be killed before he had gone very far from shore. For a moment fear held him speechless and without an idea. But suddenly his wits seemed to come back to him. Perhaps friendliness might appeal to them. He forced a smile and spread out his hands in welcome. "Do-ak!" he exclaimed, which was to say in the language of the Cave People, "Friend, welcome." For answer, the Flat Head leader looked at him suspiciously, and his eyes narrowed more as Tao, putting on a bold front, waded out of the water and up onto the sand close to the pile of mussels he had tossed up onto the bank. To these he pointed. "If you are hungry, here is food," he said. Then bending, he made to pick up a handful of the black shells. As he stooped, savage grunts caused him to straighten suddenly and step back, for the Flat Heads, to a man, had construed his movement as a threatening one. They did not know but what he was picking up these round, black things to throw, and a stone in any man's hand was a dangerous weapon. All five closed in on him swiftly with clubs raised menacingly. When he shrank back however, they paused and the leader looked down at the pile of mussels curiously. He picked one up, examined it, shook it to his ear as he would shake a bird's egg to test it, then perceiving that it contained something, he mashed it between his strong forefinger and thumb and as the contents dribbled down his fingers he licked the juice. "Why do you not roast them? They are better that way." The Flat Heads looked at him curiously. They did not understand. They looked at the fire. They did not understand it either. Tao picked up a handful of mussels then and carrying them to the fire dropped them into the hot coals while the Flat Heads gathered around in a circle and squatting on their haunches, watched him and the mussels expectantly. Tao waited until the heat opened the shells, then he scraped one out with a stick, picked up the steaming clam and handed it to the Flat Head leader who examined it a moment, then swallowed it. Roasting had made it much more tasty. A look of pleasure crossed his countenance and his hand darted out to seize another mussel from the coals. Before Tao could shout a warning, his fingers closed on one of the hot shells only to drop it again as he pulled back his hand with a howl of pain and danced round and round shaking his fingers and blowing on the scorched places. Tao did not laugh, though the incident struck him funny. The Flat Head leader and his followers were too much alarmed and too angry. Indeed while the leader still howled with pain, the other four glared at Tao and grasped their stone hatchets tighter. It was plain to the Cave boy that they thought he had had in some way been responsible for the injury to their leader. Tao made haste to explain by words and motions that the mussels could be dragged from the fire with a stick and if they waited long enough, they would cool. After a time, they understood and sat around patiently while he roasted and served them the whole pile of shellfish to the very last one. But Tao was not so generous that he did not contrive to get his portion of the feast and he was as well filled as any of the Flat Heads when the last one had disappeared. Pleased and comfortable, the Flat Heads crouched on the ground and talked among themselves after the feast, and with the glances they gave Tao, the Cave boy realized that they were talking about him: that they considered him their captive and that they intended to take him with them back to their country. THIS alarmed Tao. What was he to do? He was utterly helpless. He could not fight one of these dark giants, let alone five of them. If only Og and Ru were there. The Big and Little Bowmen, with their stout bows and their long deadly arrows would soon make short work of these big fellows. Tao glanced anxiously toward the forest and up among the limestone hills. But he realized that the chances of the return of the Bowmen in time to save him from the Flat Heads were small. They would be gone until after high noon anyway. By that time, the Flat Heads would have departed and taken him with them. Indeed they already showed signs of wanting to be on the move. Og and Ru would come back and find the fire out again and their camp deserted, nor would they know what had become of him. If he could only leave them word; some message. If he could only let them know what had happened to him, and where the Flat Heads were taking him. Tao began to think hard, and as he did, an idea came to him. Why not draw a picture of the Flat Heads. Perhaps Og and Ru would understand then. Swiftly he smoothed a place in the sand with his hand and drew a picture of a big man with sloping shoulders and a flat head. It was a crude likeness that resembled a big bug standing on its hind legs. But Tao felt sure that Og would be able to read the picture and with the many footprints about the camp fire, comprehend. It occurred to him then that it would be good to let Og know how many Flat Heads there were in the party. Tao had no way of counting. But there were as many Flat Heads as there were fingers on his hand. If he drew a picture of a hand would Og understand that? He was sure he would. He traced a hand in the sand and then to make sure that Og would know what he meant, he broke five short sticks and stuck them up in a row like men walking. By the time he had done this, the Flat Heads were ready to move. The leader came to Tao on the far side of the camp fire and spoke to him, in a strange clacking tongue. But he used many of the simple words of the Cave People which Tao readily understood. They were going to go on up into the mountains and they intended to take him with them. The leader saw Tao's drawings in the sand and looked at them curiously, with brow puckered. The other Flat Heads saw his perplexity and they came and looked too. But they could not comprehend that they were looking at the first written message ever contrived by man, and so after a moment of grunting, they lost interest, and the leader started out of the little camp clearing toward a game trail that led into the mountains while the rest followed, taking Tao with them. Then because they did not understand his drawings in the sand they did not stop Tao when he drew a third symbol as they left; an arrow pointing the direction they had taken. Tao was very pleased with himself and he forgot about the fact that he was a captive when he thought of how be had left word for Og and Ru, telling them just what had happened to him, as well as informing them how many men were in the Flat Head party and which direction they had taken. It was a new idea; this leaving a message. He resolved to leave more messages for them; indeed make a trail that they could read if they followed him, which he was certain they would do when they returned to camp and found that he had been taken away a captive. So all along the line of march up into the hills, through deep canons, across a great forest-clad plateau, and finally down onto a broad jungle-covered tableland, he left his trail signs every chance he got, an arrow scratched on a rock, a branch broken or bent in the proper direction. Cones piled one on top of another, indeed he put into effect every ingenious idea he could think of, to leave a message for Og and Ru to read. Late in the afternoon, they reached the Flat Head village. To Tao it was a strange place. His people had always lived in caves. Long ago they had become strong enough with their weapons and with the use of fire to drive out the great bear and the sabre-toothed tiger, and the big pythons, from the caves they inhabited, and take possession of them themselves. But the Flat Heads had not been able to master the animals. They did not possess fire, nor had they developed weapons sufficiently strong to permit them to conquer the animals. So they lived in trees. Since they had crossed over the mountains, Tao had noticed that the country had changed in character. The trees were different, the jungles thicker. There were tall trees with feathery tops, there were thick growths of twisted lianes and rattan. There were trees that looked like ferns, with huge fronds, and there were trees that had great trunks and reached out far-spreading limbs to drop down trailers which, in turn, became rooted and grew so that a parent tree sometimes covered a great area. Tao did not know that these were banyan-trees, and that the Flat Heads had marched him southward into a sub-tropical country, where the sun was always hot and snow never fell as it did in winter where the Cave People dwelled. It was into a clearing in a forest of these spreading banyan-trees, at the foot of a great mountain that the Flat Heads brought Tao, and it was in the branches of these spreading trees that Tao discovered their houses, strange structures of branches and leaves twisted and tied together, with platforms for floors. Suddenly, Tao remembered something else old Sud had told about these strange people. Their fear of the creatures of the jungle sometimes drove them to make strange sacrifices, goats; sheep, and even human beings. Could it be that they intended to offer him as a sacrifice to some one of the jungle creatures? The thought caused his blood to chill in his veins for a moment. While the crowd of Flat Heads gathered closer, suddenly from a distance a loud shout was raised, accompanied by a sinister booming sound. Instantly the crowd of Flat Heads became quiet and fell back a little, to reveal to Tao, marching solemnly toward him, a short, thickset, but quite wizened-looking old man, daubed with strange smears of color, that looked like mud. He wore, too, a peculiar headdress of feathers and what seemed to be a cape also made of feathers. In his hand he carried a huge war club, peculiarly twisted, and by this token Tao knew that be was the chief of the Flat Heads. Behind him came several other men almost as old and as ugly-looking as the chief. They too wore feathered headdresses and capes and with them marched two young men beating on sections of hollow logs. This display and the solemnness of the approach of the tribal chief awed and frightened Tao. The wise heads of the village were going to hold a council to decide his fate. Tao knew that it would be a meeting of great ceremony. The wise heads of the Cave People always went through a similar proceeding before some important occasion, during which they donned all the finery they possessed. Only instead of feathered head-dresses and robes, the Cave People's councilmen wore tiger-skin and bear-skin robes, and carried spears and great stone hatchets. Their drums were different too. They were tom-toms made of dried goat skin stretched over the tops of hollow logs. Nor did these Flat Heads have a great council fire burning in the center of the council grounds. Their center of interest was a flat area at the base of the mountain from which a path seemed to lead upward toward the dark opening of a cave on the side of the mountain. Here the chief and the council formed a big semicircle like a crescent moon, with the rest of the Flat Heads gathered at a respectful distance. Into this circle marched the five hunters, shoving Tao ahead of them, and into the circle, too, came an elderly Flat Head man, whose body was thickly daubed with black mud. To Tao he was a strange, pathetic figure, who had seemed to have been made unhappy by some great calamity. Tao could read that in his attitude. Nor did it take him long to divine the old man's story and the horrible part he was to play in it when the leader of the five hunters who had captured him began orating in a very boastful manner. It seemed this man had lost a son. He had been killed in the forest by some jungle creature, which was a sure sign that the ruler of all the jungle creatures, the monster who lived in the cave on the mountain, was angry with the Flat Heads. The hunters had been sent out from the village to capture a goat or sheep or some creature to offer as a sacrifice to the jungle ruler, and after great hardships and a long journey, they had captured one of the Cave People. This seemed to please the chief and the council and all the Flat Heads for they cheered lustily, and beat upon the hollow logs while they looked up toward the dark opening of the cave on the mountain. When Tao saw this demonstration and realized all it meant, he grew sick with fear. There were other speeches, by the chief and by each of the council members as well as several of the hunters. Then suddenly and unexpectedly two of the council members leaped to their feet and rushed upon Tao, pinning his hands to his sides. A third, the hunter-leader, twisted his hands behind his back and bound them there with a strand of rattan creeper. THEN while the drums beat, and the people began to sing a weird chant and sway their bodies in a peculiar dance, one of the men brought a gourd of water and scooping a hole in the ground with his hands, poured the water into the hole and began to mix huge quantities of mud. Meanwhile, the old chief tore off Tao's bear-skin shirt and left him standing naked. And then all the members of the council, one by one, scooped the mud from the hole and each daubed Tao generously with some of it. But Tao did not care. He was too sick at heart. He knew what they were doing. They were preparing him to be sacrificed to the monsters in the cave up yonder, and he was utterly powerless to help himself at all. Daub after daub they smeared on him until he was a hideous spectacle, then suddenly with the drums beating louder and the people shouting and singing in a fierce ecstasy, the five hunters seized Tao and began to march him up a steep path on the mountain side while the chief and the council and half the village followed. Tao's spirits plumbed their depth then, for he realized that in all too brief a period he would be facing this unknown peril within the cave; this monster whom the Flat Heads believed to be ruler of the forest. What manner of monster could it be that these people feared so much, he wondered? Was it sabre-toothed tiger, or great bear, such as his people had had to drive from the caves of their country, or was it some great unknown animal of this strange region? He was soon to know. Halfway up the path toward the cave, the people began to lag. They looked apprehensive  frightened. Even the hunters who led him forward, slowed up and had to be urged onward by the old chief and the council members following. Presently they reached a broad shelf, and just ahead and a little above them yawned the wide opening of the cave, far larger than it had looked to Tao from below. Here the hunters and the old chief halted, and gazed fearfully into the cave. Then swiftly, hurriedly, one of the council members produced a coil of dried rattan and the hunters, taking it, forced Tao back against a rock and bound him fast, in a position where he stood facing the entrance of the cave. Nor did they lag with their work. Indeed, before it was finished, the old chief and the members of the council started down the path again and the hunters, as soon as they had made Tao secure, hurried off the shelf and ran wildly down the path, so fearful were they of the menacing creature who dwelled in the cave. Almost before he realized it, Tao was left alone, facing that dark, yawning opening. For a little while only heavy blackness greeted him. As he watched that menacing darkness, however, two pin points of fire developed to grow slowly larger and fiercer, until Tao realized that he was looking into the evil, menacing eyes of some creature that was moving slowly through the darkness toward the mouth of the cave. Again his heart pounded fiercely, while a strange thickness gathered in his throat and his tongue became suddenly dry. The monster of the cave had discovered him. Indeed it was coming slowly toward him, watching him, studying him with evil, blazing eyes. As yet all he could see were those two gleaming orbs. They seemed to float, detached in the dark interior. 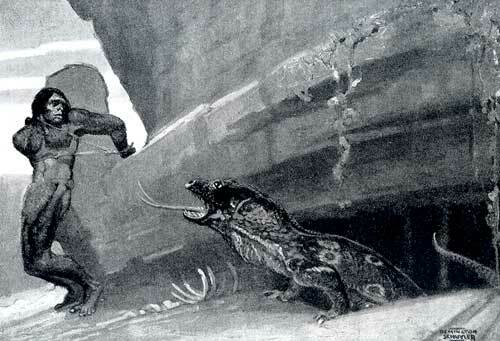 But presently, as he listened, he could hear a soft, slithering sound across the stone floor of the cave. At the same time a strong, unpleasant, musky odor came to his sensitive nostrils. A cold chill ran up Tao's spine. It was a huge monitor-lizard, one of the great flesh-eating reptiles. Suddenly Tao knew, and a cold chill raced up his spine. It was a huge monitor lizard; one of the great flesh-eating reptiles. Sud had told about them. They lived in the hot country. That was the monster the Flat Heads dreaded and to which they offered sacrifices. Tao could make out its long, jerkily moving form now. He could see its ugly head and long, powerful jaws. It had reached the cave entrance. He could see the sinister yellow and black of its scaly, pulsating throat. He could see the larger, gleaming scales of its back. He could see its short, stumpy legs with its strong claws. Its length was lost in the darkness of the cave but Tao estimated that it must be almost twice as long as the height of a man, truly a savage, menacing creature. At the entrance it stopped a moment and stared at Tao with its cold, merciless eyes. It seemed suspicious, and appeared to be studying him to determine whether this was some form of trap set to capture him. As it watched him it seemed to raise its body higher and higher on its short legs, while its eyes glowed more balefully and its long ugly jaws opened slowly, revealing savage teeth. Tao's fears almost petrified him then for he realized that the big lizard was slowly preparing for one fierce rush at him; one lightning-like dart. After that, the end would be swift  and horrible. Two sharp strumming sounds accompanied by fierce yells in voices that he knew told Tao that rescue was near at hand. "He is dying. Look, he staggers. He can scarcely make the cave." "We will follow him in. Another arrow and he will be dead," cried Ru, plunging hastily forward. But Og cautioned him. "Not so fast. Here is poor Tao. Let us free him first." Drawing his flint knife as he spoke, he hurried to Tao's side. As he slashed his bonds, he talked happily. "We came in time. Your pictures in the sand served you well. We saw them. We could read the story. We followed your trail fast. Almost we caught up with you. We saw them bring you up here and we followed through the forest." Tao, as he heard this, was happy. "I am glad. Come let us get away before the Flat Heads discover you are here. Hark, they are shouting down below. They have seen what has happened up here. They may come up." But they could not flee, for Ru, bent on destroying the wounded lizard, had followed it into the cave, and Og, to help him, plunged after him. There was nothing for Tao to do but follow. Scarcely had they gained the entrance to the cave, however, before a shout from Ru made them hurry forward faster. "He is dead! He is dead! Our arrows killed him. And look! Here is salt! Great rocks of it! Come! Hurry!" "Salt!" The word had a magic effect on Og and Tao. They forgot the Flat Heads as they hurried forward, for had they not spent two moons searching for some of that white medicine sand? Ru spoke the truth. Deep into the cave, where the lizard lay dead, they saw great layers of salt in the stratified earth; a big subterranean bed of it with stalactic formations of it hanging from the ledges of rock and the vaulted roof. "We have found it! Our search is ended!" cried Ru excitedly. "Yes, we have found it, thanks to Tao's picture writing and the trail he made," added Og, justly. "But it is not ours," reminded Tao. "This is the land of the Flat Heads. It belongs to them, this salt." "No, it belongs to us. We have found it! We will take it! We will fight for it!" cried Ru fiercely. "They are too many for three of us to fight," warned Tao. "They are a fierce people. But they may give us some for slaying the lizard." Then he added suddenly. "And, perhaps, we can exchange some of the things we possess in our country for more of it. They like fresh-water mussels, and we have many of them. A bear skin filled with mussels in exchange for a bear skin filled with salt. It would be fair, and we would all be friendly." Og looked at Tao, amazed for a moment ' as the suggestion penetrated his brain and grew to be a worthwhile idea. "Tao thinks wise thoughts! They are good! Hark, the Flat Heads are coming up the mountain. We will go out and talk with them. They should be happy we have killed the lizard and willing to trade with us. Tao's brain works like that of a wise man. Let him talk with the Flat Heads."